Well, it finally happened: at long (long, long, long, long…) last, I’ve completed Mandingueira’s one-year retrospect magazine! This will sound super lame, but pretty much my only excuse here is…Montreal is just way too much fun. That, plus a 1.5-hour commute to/from work (each way), and the rest of the time I’ve been taking a prep course/studying to take the MCAT in a couple months (the entrance exam for applying to medical schools in North America…please don’t ask, it’s a long story). At any rate, lest we forget, today is International Women’s Day. And oh god, do we have a long way to go. So, I figured, what better timing for the release of a commemorative magazine about a feminist capoeira blog? Just so you know, I haven’t actually been working on this for the past three months straight. In fact, I’d completed all but the table of contents & editor’s note right before leaving for Montreal, and just didn’t manage to return to it until the other day! Now, there are a couple ways you can view the publication. First, I HIGHLY recommend clicking on the main image link provided below. It leads to an absolutely beautiful set-up by issuu.com, where you can virtually flip through the magazine as if it were on a table in front of you. Next, I’ve provided two pdf files you may download for (1) easier reading or (2) printing! The first file has the magazine’s spread layouts retained (from which you could print out the centerfold as a poster), and the second splits it up into all single pages. Finally, you may have noticed a new widget on the sidebar featuring the magazine. This is so it’ll always be available for anyone new or returning to Mandingueira to check it out! Also, please do make sure to check out the final two pages. I loved, loved, LOVED putting this magazine together, and think it’s one of the best projects I’ve ever done. I hope you enjoy it! Yay! The Magazine looks fantastic. You put so much time and energy into this. It was well worth the wait. Parabens! It looks even better than I could imagine. So professional! Wow! Parabens! I love your blog. Thanks for the wonderful insight. 🙂 I look forward to reading more. That is beautiful! Did you design it? As an incentive the practice of capoeira and memory of african-Brazilian culture, the 3D short film Pernas Para Voar is a tribute to the legendary Besouro Cordão de Ouro. 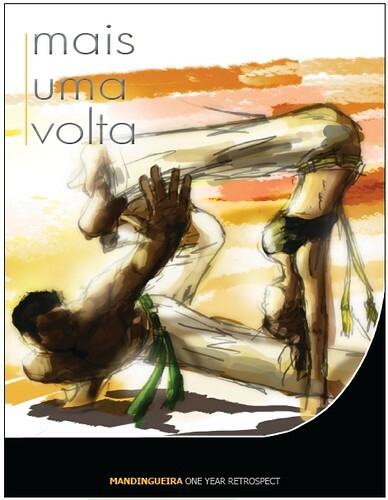 Awarded by Petrobras and the Brazilian Ministry of Culture in Edital Capoeira Viva. Looks great Jo! I know I’m way late to the party here but I just now got back to reading all these capo blogs.